A window into our lives living in Niagara: Raised Front Yard Boxes - A throw-back! 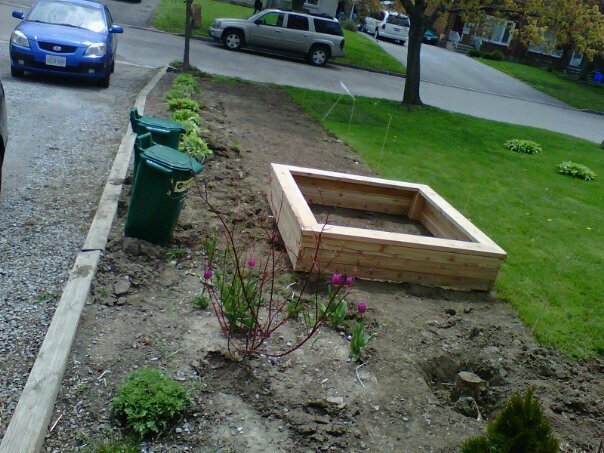 Raised Front Yard Boxes - A throw-back! During the winter of 2010, I got a little stir-crazy. I was running a home daycare and knew that the backyard was 100% reserved for the children to roam and play freely. 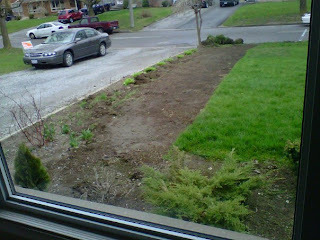 I also knew that I didn't want to sacrifice plants at the expense of innocent little rubber boots. 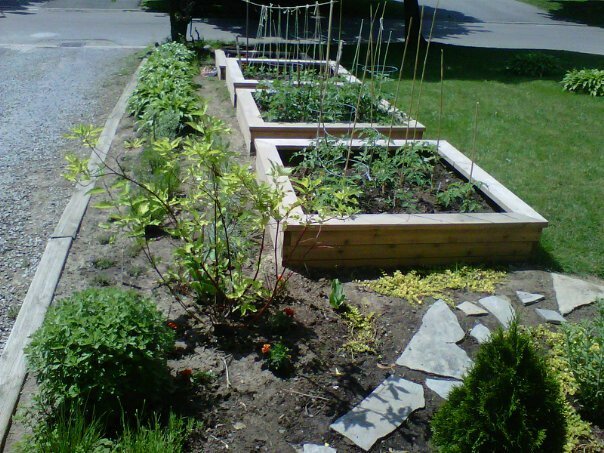 Our front-yard gets a FULL days worth of sun anyways, and is the ideal place on our small property here in Niagara to grow veggies and fruit. Colin and Jessica are wonderful friends of ours, and Colin was apprenticing for carpentry I wanted an excuse to see them, and he needed an excuse to show us his newly developing carpentry skills. 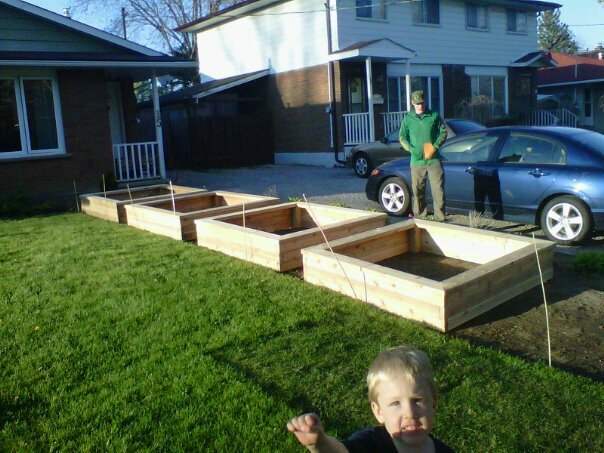 Enter the concept of raised veggie beds. We had a whole winter's worth of blackberry messenger back-and-forth about what they were going to look like, how much lumber I would need, what kind to use, etc. While I can't tell you how much I paid for the entire project... because my husband would spit out his smoothie... I will tell you that it paid for it's self last year (2 summers worth of fresh veggies) that we would have bought in the grocery stores. Materials: We used kiln-dried, untreated local cedar. That was THE most expensive part of the project, but it's supposed to last 25 years. If we ever move... they are coming with us :o) Colin told be exactly how much we needed, and the dimensions were perfect. space did not appeal to me. This baby did the work in 15 minutes, and saved my back. Sorry Environment... I won this round. All tidy, level, and trim. Here is my hired help. :) He's not actually camera shy. I asked Colin to make the boxes with a "sitting lip" for when you want to rest your elbows or bumm while weeding and harvesting. We had a few folks drive by and ask of we were building sandboxes... or if the boxes were for sale. Noppers! These babies are ALL MINE! The cedar lumber smelt SO GOOD when Colin was cutting it. Jessica and I spent some time indoors during the weekend making some laundry soap together, and cooking some yummy meals for the working men. I am thankful for her listening ears and heart. She is one of the BEST listeners I know. In the above photo you can see is was raining the morning Colin started the project. 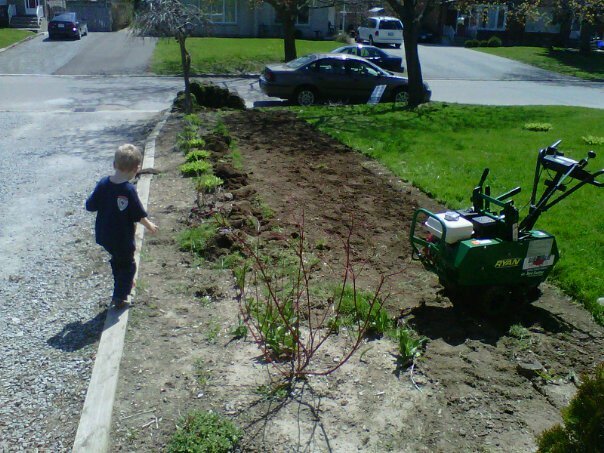 He was not phased by the wet weather, and hummed the Mike Holmes theme song :o) By noon, the sun came out, and the remainder of the day was lovely. Progress! Box #1 is complete! Box #2 Ready to ROCK! I had to put SK down for a nap, and missed 3 and 4... but here they are. Colin is seen here observing his terrific handy-work! Shortly after this photo was taken, we treated Jess and Colin to ice cream at the Avondale Dairy Bar. 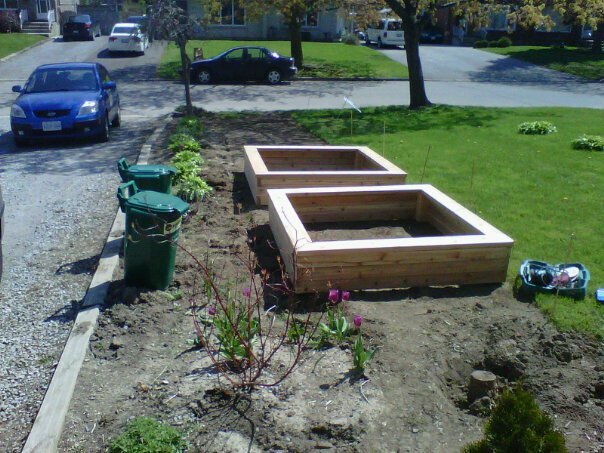 This photo is of the boxes filled with soil (Thank you Tom from Tree Amigo's Landscaping for your delivery of triple mix!) We grew our first front yard harvest that season with virgin soil, no pests, and has LOTS of goodies to share with friends and neighbours. This photo is from another trip they took to visit us. They are spiffed-up here for Geoff and Violetta's Wedding. I can't wait till they have kids, cause they will be gorgeous! We are so thankful for the freedom to grow our own food on the soil we own. The first weekend in May I am hosting a little neighbourhood seed sowing event with the children. I have sent out invites to most the children on our street (10 homes), and have had 15 RSVP for the event! More about that event, after it takes place.